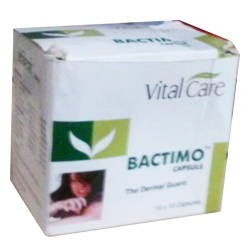 Bactimo Capsule Tough protective cover for tender skin - Online Shop India - Vital Care Products. An adjuvant treatment in leprosy& Psoriasiss. Rubia cordifolia (Manjistha)	- 600 mg.
Psoralea corylifolia (Bawachi)	- 600 mg.
Holarrhena antidysenterica (Kutaj)	- 550 mg.
Azadirachta indica (Neem)	- 400 mg.
Cassia tora (Chakramarda)	- 400 mg.
Cassia occidentalis (Kasmard)	- 300 mg.
Berberis aristata (Rasanjan)	- 250 mg.